All our Running Analysis services start with a chat with a member of the team, so we can get to know your running aspirations, your running history and any other sports you may do, and discuss any previous or current injuries/aches and pains. We can also offer advice on warm-ups and cool-downs and recovery strategies. You will be asked to run on our treadmill while Jo observes you running from different angles and takes some slow-motion video footage to backup what we see in real time. We’ll be looking at your running technique, where your body may be compensating as you run, and where you may be at risk of injury. You will then sit down together and discuss the findings and recommendations. We’ll also do some low to medium level Functional Movement Assessments with you. This enables us to identify areas of movement deficiency, compensations or dysfunction in movement, muscle activation, and firing sequences of the neuromuscular system. You will then sit down together and discuss the findings and any recommendations. Once he has fully assessed you will be asked to run on our treadmill while Bob observes you running from different angles and takes some slow-motion video footage to backup what we see in real time, while data is collected from the 1Optogait system. We’ll be looking at your running technique, where your body may be compensating as you run, and where you may be at risk of injury. You’ll also walk and run over our foot pressure plate. This is linked to a computer that can take a 2D and 3D image of how your foot lands while walking and running. This allows a detailed analysis of when and where force is being applied during your foot landing, highlighting any “hot” spots that may cause a problem. If there is an imbalance occurring this will also be highlighted. This will enable us to advise on the best type of trainers to use and if you are likely to benefit from inserts/orthotics. With all the observations and data gathered you will be taught any stretching or strengthening exercises that may assist you to overcome any tight or weak areas that you have. You’ll be given an advice sheet detailing the recommendations for your running trainers and any stretches or strengthening exercises we teach you. This is the same as the Standard Running Analysis with the addition of you wearing a pair of our 2mBody shorts. 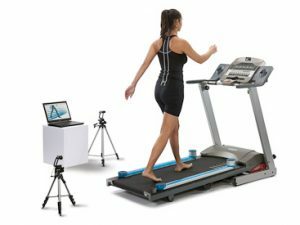 Optogait is an innovative system for movement analysis and functional assessment. The system is equipped with two bars of optical sensors that detect the relevant space and time parameters for running and gait analysis. The data collected, along with the observations of our experts can be used to detect problem areas, assessing mechanical inefficiencies and rapidly verifying the existence of asymmetries between the two legs. These technically loaded shorts assess your muscle activation patterns. Data collected will spot muscle imbalances between the left and right sides and between hamstrings, quadriceps and gluteal muscles, that often have a high occurrence of injury. It will also highlight activation patterns during activity which links to efficiency during running or other sporting activities. It will greatly benefit your running analysis assessment if you are wearing a running top and shorts. If you aren’t the type to wear shorts, that’s okay – a pair of running tights will be sufficient. Remember to bring along your running trainers and if you already have them bring your insoles/orthotics! The clinic is heated to typical house temperature for patients undergoing physiotherapy to keep them comfortable. Therefore you may get a little warm and we would recommend bringing a towel along with you. We have plenty of water to keep you hydrated during your session!